Welcome to the eleventh episode of AEM Early Access, a FOAMed podcast collaboration between the Academic Emergency Medicine Journal and Brown Emergency Medicine. Each month, we'll give you digital open access to an recent AEM Article or Article in Press, with an author interview podcast and suggested supportive educational materials for EM learners. Ambrose H. Wong MD, MSHPEd, Jeremy Ackerman MD, PhD, Margaret K. Sande MD, MS,MSHPEd, Charles Lei MD,Leo Kobayashi MD, Michael Cassara DO, MSED, Dylan D. Cooper MD, Kimberly Perry,William E. Lewandowski MS, Mark W. Scerbo PhD; Academic Emergency Medicine 2017. Human Factors (HF) is the scientific discipline concerned with the understanding of the interactions among humans and the other elements of a system, and the profession that applies theory, principles, data and methods to design in order to optimize human well-being and overall system performance. During the 2017 Academic Emergency Medicine Consensus Conference, the Human Factors and Simulation in Emergency Medicine breakout group presented their findings of the current state of the topic as well as gaps in research and understanding. This article serves to document the breakout group’s findings. The field of human factors (HF) examines the physical demands, mental workload, team dynamics, work environments, and device design required to complete a task optimally and improve safety and effectiveness. HF methods have been used to examine aspects of individual performance, such as task switching exhibited by EM residents, clinical decision-making, EM team performance in traumas and codes, and task saturation for those involved in rapid response and critical care transport. The authors put forth three main positions regarding the future of HF research in Simulation and Emergency Medicine: 1) Emergency medicine simulation should promote the use of HF approaches to address emergency care by educating their stakeholders and col- leagues as well as leading successful collaborations that lead to improved safety and outcomes; 2) Application of HF in EM should focus on demonstrable outcomes in patient safety and clinical outcomes that should be disseminated widely to all stakeholders (e.g., the public, policy makers, payers); and 3) Collaborative and structured relationships should be fostered and established between EM simulation and HF professionals using existing academic structures at the local, regional, and national levels. Fidler R, Johnson M. Human Factors Approach to Comparative Usability of Hospital Manual Defibrillators. Resuscitation. 2016;101:71-76. Cvach M, Rothwell KJ, Cullen AM, Nayden MG, Cvach N, Pham JC. Effect of altering alarm settings: a randomized controlled study. Biomed Instrum Technol. 2015;49(3):214-222. Kobayashi L, Dunbar-Viveiros JA, Sheahan BA, et al. In Situ Simulation Comparing In-Hospital First Responder Sudden Cardiac Arrest Resuscitation Using Semiautomated Defibrillators and Automated External Defibrillators. Simul Healthc. 2010;5(2):82-90. Zhang XC, Bermudez AM, Reddy PM, et al. Interdisciplinary Development of an Improved Emergency Department Procedural Work Surface Through Iterative Design and Use Testing in Simulated and Clinical Environments. Ann Emerg Med. November 2016. We conducted an online survey of the approximately 200 EM providers (attendings, fellows, residents, nurse practitioners, and physician assistants) affiliated with BrownEM. The survey asked providers which medical apps they had downloaded on their mobile devices and which apps they actually used on a regular basis. Ninety-nine providers answered the survey (response rate 49.5%); the distribution of respondents was 51% attendings, 33% residents/fellows, and 16% NPs/PAsThe results of the survey are presented below, categorized by type of mobile app. Most of the apps and resources described below are widely used and highly circulated throughout the emergency medicine community. Just as in consumer mobile health, we found that although many apps are downloaded, few are used on a regular basis; on average, BrownEM providers reported that they had six medical apps downloaded on their phone, but only regularly used two. Highlighted below are the apps that providers most frequently find themselves using in day to day practice. BrownEM has no financial ties to any of these applications or their developers. 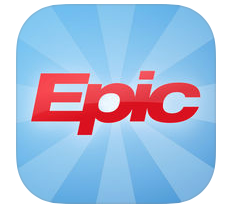 The essential companion application for the Epic EMR. The most useful feature is the ability to capture clinical images and upload them to the patient’s chart. Because sometimes a picture really is worth a thousand words. One of the most widely used, peer reviewed online reference sources for physicians. A great resource for a quick refresher on a topic, however much information is not necessarily important for ED management. 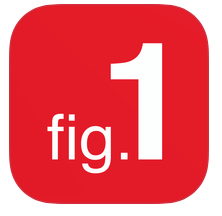 An app that aggregates clinical decision rules, medical formulas, and other hard to remember checklists/criteria. Simple to use, free to download. Also available online. All-in-one application with guidelines, pill identification, drug interaction tool, drug monographs, and more. 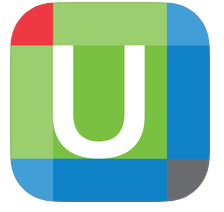 Free app with limited features, or a premium version is available. 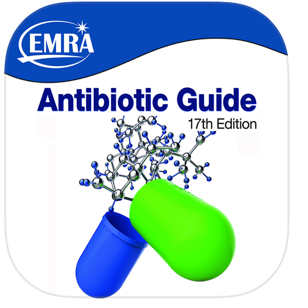 The official antibiotics guide published by EMRA. The app requires a $20 investment but is updated yearly with new recommendations for drug choices. An incredibly helpful resource for when you can’t quite remember what drug to reach for or its dosing. Mobile version of the opensource, wikipedia-like encylopedia of emergency medicine. A good quick reference with the caveat of it being publicly editabe. Similar to Epocrates but is free and has an offline version. Good resource for pill identification, drug info, and drug interactions. A simple, straightforward app for checking visual acuity at 4ft. When looking at the educational resources used in our department, there is one clear winner. 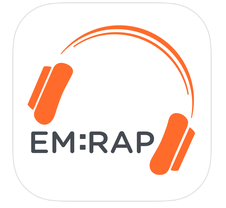 EM:RAP is the go-to resource used by almost every single survey respondent. A few apps are featured below that may be worth investigating as they are fun, educational, and easy to use. The well-known and almost ubiquitous EM:RAP is an excellent way to keep current. With new podcasts and content published on a monthly basis it can be considered an EM staple. Paid subscription is required for the content, but the app is free. A literature aggregator. Fill in your specialty, favorite journals, and areas of interest and it will pull together recent articles geared towards your interests. An amazing way to keep up with the literature. It integrates with Brown’s library system to access articles. 60 second video clips of the bread and butter EM ultrasound scans. Perfect for showing students or a quick refresher before going into a room. A series of interactive clinical vignettes where you must chose the correct workup, management, and disposition for an evolving patient presentation. Finally, multiple providers made suggestions for resources they find incredibly helpful but are not app based. Below is a compilation of some of the top websites, programs, resources, and organizational tools that help some of us keep it together. Evernote – A could based platform for organizing notes, documents, and files across multiple devices. Dropbox and Google Drive – Online cloud storage platforms that allow for the sharing of documents, images, files across computers and with other users. Essential tools for the modern EM provider. Lexicomp – A comprehensive drug reference with information regarding dosing, efficacy, and adverse effects. Access is provided for free through Lifespan intranet. A mobile app is also available to download. BrownEM has recently taken the plunge into the podcasting world under the guidance of Dr. Gita Pensa. Check out the BrownEM podcast here. Blogs – the online companions to many podcasts, twitter accounts, and residency programs. Great sources of information that usually have posts on relevant and interesting topics, with useful images, original content, and amazing references. The two most highly recommended by our providers are Life in the Fast Lane and Academic Life in Emergency Medicine. At SAEM 2016 in New Orleans, Brown EM presented a session on this year's top ten apps and electronic resources for medical educators. Here's a quick tour of which tools we think are among the most useful, divided by task type. Click through below to check them out yourself, and then let us know what you think, or about any of your favorites we may have left out, in the comment section below. 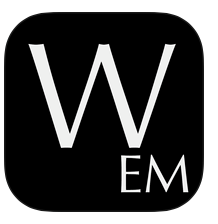 Join Twitter to surf the #FOAMed world and follow the explosion of EM Blogs. Start with us here at brownemblog.com, and follow us on Twitter at @BrownEMRes! Need a Twitter starter for beginners? Click here for our Twitter Starter Handout. Do you have a favorite tool we haven't mentioned? Tell us about your favorites in the Comment section.